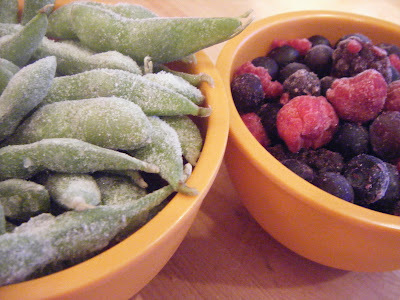 Frozen edamame (left) and a cup of mixed frozen berries — straight out of the supermarkets’ frozen foods-section. Edamame in the pod aren’t just for sushi bars anymore. You can pop those soybeans right in the nuker (or blanch them, if you’d rather), sprinkle a little salt over the top and quick as you can say “Bob’s your uncle!” you’ve got a healthy and inexpensive treat. Those berries — which, as far as I’m concerned are the sale-of-the-century — came fresh-frozen from Carnation’s Remlinger Farms. I’ve seen them elsewhere, but I got those at Shoreline Central Market. 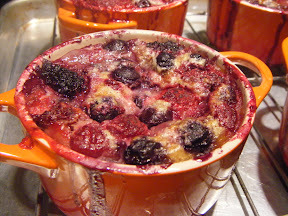 I hesitate to tell you about Remlinger’s “Berry Jubilee” (or the Montmorency cherries I snagged not too long ago) because they’ll probably be sold-out next time I look. But how can I not share that happy news: a three-pound mix of blackberries blueberries, strawberries and marion berries for less than $10? Just think of all the things — healthy, and not so — you can do with that. 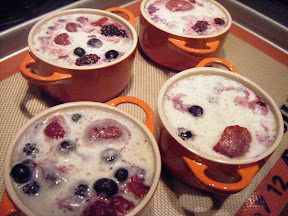 Nate’s tweaked version of Julia Child’s clafoutis recipe: before — and after. Of course there are plenty other frozen delights in my freezer, including but not limited to a bottle of Stoly and Trader Joe’s frozen steel-cut oatmeal (don’t knock it till you’ve tried it). And it got me wondering: What frozen “finds” are chillin’ in your freezer?